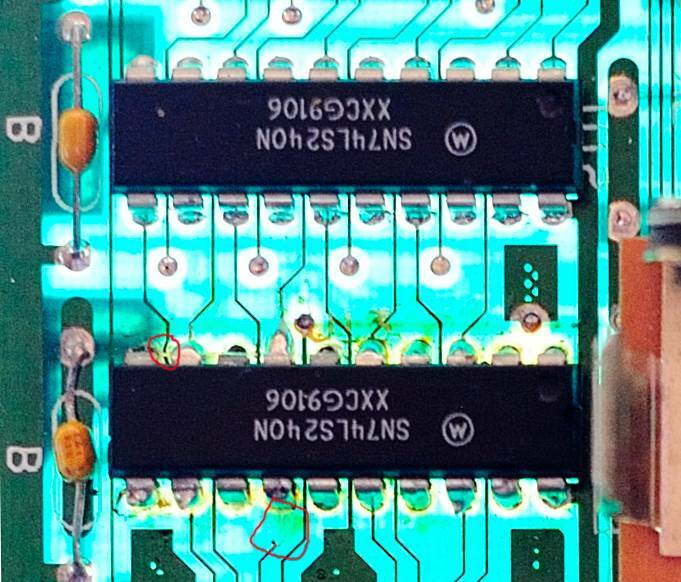 Just thought it might be useful for someone with an example of how broken traces on a circuit board looks. Especially those who are new to these kind of things. Below is an example of broken traces at the U13 chip from a WPC CPU Board. I held it against a lamp to make it easier to see. Found them when I was trouble shooting the board. One can also see how someone soldered at the pins of the U13 chip as compared to the untouched pins of U12 on the top. The reason for the broken traces I don't know but I think that maybe they replaced the U13 chip and used a bit too hot soldering iron that wekened the traces. I can think of a number of ways and reasons for traces to get damaged. I imagine the reason is someone had poor soldering technique (or desoldering technique if replacing the chip), and peeled the trace off when removing the chip. Great photo, and a perfect example of why someone with no experience should not be doing board work. You missed the bad traces at pins 7, 9, and 12 too. Certainly more under the IC as well. Yeah its not pretty! Hopefully I can manage to fix it. 7, 9 and 12 yes indeed, thanks for pointing it out! perfect example of why someone with no experience should not be doing board work. Could be worse. I have a board where someone tried to replace a TIP32 transistor and burned thru the board so badly you can see the silhouette of the soldering iron tip... kind of like when Bugs Bunny smashes through a wall. In no way am I defending a sloppy solder job, but damn those traces are thin. I'm not sure how the rest of you handle soldering on fragile/multilayer boards, but what I do is take a small pair of pointy end cutters and cut each pin and remove the body of the chip, then remove the pins and vac out the holes one at a time. This works especially well on the ground pins in multilayer boards where you have 7 layers of copper to heat up to get it to release the ground pin. Much better to trash a 50 cent chip than a $$$$ board. BTW, to add insult to injury, by the date codes, it looks like whoever went through all the trouble of pulling the chip out put the same one back in. Yeah, some of those later WMS boards had absurdly thin traces on them. Did you backlight that to look for the busted traces? Never even thought of that, but makes such perfect sense that I feel like a bonehead to have not realized it earlier. That thing could cost $1000 and still be worth it. With the proper tools and technique you can remove ICs with out clipping the legs. When there is a fat ground trace or fat power rail i use a pen iron 888 and the desolder 808 to apply heat. Just takes practice and the right tool. NEVER DRAG THE TIP of your desoldering iron across the board as you desolder, that is how you lift pads and traces. Boards get mangled like this one someone is using a flame thrower and a solder sucker bulb. I am getting to the point where i am refusing doing work on boards where someone has failed repair attempt in the past. I would rather clean up a virgin battery damage board than patch one that had failed IC removal and sloppy trace patches. I have a movable magnifying lamp mounted on my work bench. It uses one of those circle flourscent bulbs. Some times i will point the lamp up at the ceiling and sit the board on top of it. Lights up from the bottom and you can visually see the traces on both the component and solder side (of most boards, some are more opaque than others). Repairing damaged traces, dare I say, is actually fun for me. I like the challenge of taking a board someone destroyed and making it function and look almost new again. Not to say I don't get frustrated seeing so many damaged boards, especially when it's so easily avoided. Know your limits and don't attempt work you've never done and have no idea how to do. If you're adamant about doing your own work, at least practice on some trash boards first, before destroying perfectly repairable boards. And I agree, clipping an IC out first is good for someone with no experience. If you've got the right equipment and experience though, getting an IC out in one piece and useable again is trivial. I've often said, if you can't get an IC off a board, complete, useable condition, and no damage to the board, you should not be working on a board. With the proper tools and technique you can remove ICs with out clipping the legs. When I was doing most of my component level work, about 30 years before your fancy soldering gun came out, that was the proper technique. I don't do enough of it anymore to justify the expense, but if something changed, I would. And I could argue that it makes removing too easy, which leads to parts swapping and shotgunning, which is a piss poor way to trouble shoot. When I took a pair of cutters to a chip, I was pretty damned sure it was bad. If you don't like my methods, fine. But you don't know near enough about me to pass judgement on my skills or abilities. Very interesting that you take such offence to my comments, as they weren't directed towards you in *any* way. Nah, Rob's not getting in your face. He was just speaking in general. He's probably posted those exact same thoughts on the internet at least half a dozen times over the years. If you see him in his booth at a show, stop by and introduce yourself. He's a hell of a nice guy and a huge asset to the hobby. Once you guys find all those broken and tattered traces, without giving out all your secrets, how do you repair them? Is that 'trace-in-a-bottle' stuff they sell at Fry's useable? I keep trace wire in my tool bag, but I wonder if that stuff would do in a pinch. Tattered Traces would be an awesome name for a rock band. I thought holding the board against a backlighting lamp was a nice idea and it looks really good. I might try to make a photoshop image of it, same style as the above picture but with the complete board. The thing would be to add 2 layers, one for the front and one for the back side aligned with each other. Then in photoshop one can adjust the opacity of one layer to watch one side at a time and compare the traces. Could be handy. Might do it when I have a better board to take the photos of though. One thing i wonder though is if it would be a bad idea to hold it against sun light? I avoided it just in case. The reason is because my board has a piece of tape over one of those ereaseable chips. It is the game rom. Dont know if its "original style" or if someone burned their own. So, if held in the sunlight exposed to UV rays it might get messed up or completely ereased. If someone was planning to hold the board with the sun as backlight. Lots of ways to repair damaged traces. Jumpers are a perfectly acceptable repair, though I rarely use them. I like to get the repaired board as clean and original as possible, and jumpers don't accomplish that for me. You can go the other end of jumpers too, and completely replace the trace that's damaged. That gets very expensive though as it's very time consuming and the supplies and tools are amazingly expensive. I generally go somewhere in between and hide jumper strands under ICs and along existing traces. Usually when I finish, most folks would be hard pressed to find the repair with their eyes. Or at least not notice without a close inspection. I typically use the stitch method. I find the pulled trace/ pad and scrape off a bit of the coating to expose the trace. Thread a very thin resistor lead through the hole and then solder down the lead to the now exposed busted trace. Then the socket is installed and the resistor lead is soldered with the socket lead. Like Rob mentions, i do my best to hide it under the socket and then it is not really visible with out pulling the IC and looking for it. This is a much more neat looking repair than using jumper wires. Using jumper wires is a good solid permanent repair as long as it is done clean. Just i fix boards for resale, and people don't like seeing jumper wires. I use 30 or 28 awg wire wrap wire for most trace repair. Larger awg for power and ground runs. I don't mind the look of jumpers or kluged runs. Just about every Company I worked for would repair damaged PCBs using this method. Also for REV changes it is used all the time. Cut tracks, pins, etc run jumpers. I also use a drop of nail polish or super glue to hold down the wires. It is a great photo of WPC CPU board which helps the inexperienced person like me to identify the broken traces and I just want to add that how we can fix this problem. First of all sand the traces to peel off the green mask from the traces and then after than use a jumper wire to make the connections between broken part and then solder this jumper wire that would join the broken traces.